Ask Me Anything About the Dreamblood! 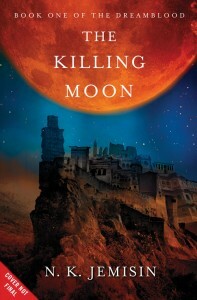 Since I had three books coming out in close proximity to each other — The Kingdom of Gods just a few months ago, and The Killing Moon in May 2012 and The Shadowed Sun in June 2012, I’ve tried to minimize confusion and “competing against myself” by not talking about the latter two books until 2012. Well, now it’s 2012, and the brakes are off. Ask me anything about The Dreamblood! Ehiru: A Gatherer of the Goddess of Dreams, Hananja. Ehiru has spent his life in service to the Hananjan faith, which values peace above all else — even life. As a Gatherer, his duty is to ensure that Gujaareh’s citizens can safely make the final journey into the land of dreams. He ensures this by killing them peacefully in their sleep in the dark of the night, and collecting the magic born of their final death-dream. Ehiru is a man of great conviction and serenity who has served Hananja without question for decades, but when his faith is badly shaken by revelations at the beginning of the story, he risks losing his own sense of peace. Sunandi Jeh Kalawe: An ambassador from Gujaareh’s motherland and rival kingdom, Kisua. Sunandi is beautiful, clever, and very very aware of the danger that Gujaareh poses, if its terrible dream-magic should ever be unleashed against its enemies. She’ll need all her wiles to survive when a literally nightmarish assassin, the Reaper, tries to prevent her from warning her kingdom about a terrible Gujaareen secret. Nijiri: Ehiru’s apprentice in the Gatherer path. 16 years old and with the ruthlessness of an old man, only one thing keeps his morals in check: his love for Ehiru. When Ehiru falters, will he have the strength to do what a Gatherer must? The Reaper: Where Gatherers kill for mercy, the Reaper kills for pure sadistic joy. This beast hunts through waking and dreaming, and its powers are growing. Who holds its leash? And what will happen if it ever breaks free? Is there a romance within this epic fantasy? Is it written from one or multiple points of view? Is book two a continuation of the voice(s) of book one or does it have a different approach/story line? I am very intrigued and am really looking forward to reading The Dreamblood!! Jann, there is a romance in the second book, but that’s not really the focus of the duo. Also, the relationship between Ehiru and Nijiri is… complicated. More than mentor-student; not lovers. Not easy to define. There are different character perspectives — the Dreamblood books are told in third person. The first book has mostly PoV chapters from Ehiru, Sunandi, and Nijiri. The second book takes place 10 years later and focuses on different characters: a priestess named Hanani, a highborn woman with a secret named Tiaanet, and a Gujaareen rebel named Wanahomen. These books are more traditionally epic fantasy in style, although not in setting or focus. Wow – I can’t think of any questions offhand, but this book sounds awesome, and I can’t wait to read it! Well I’m in love. My protagonist has a lot in common with Ehiru. I hope I do as good a job as you have writing him. What’s the story with Hananja and the dream gathering? Was there a time when dreams weren’t gathered? If so, how did they find out they needed gathering? The names are interesting too. Lots of double vowels and names ending in them. (Sorry, I studied linguistics and that’s always the first thing I notice.) Is there a real life culture or blend of cultures that you used to base the world from? The people of Gujaareh believe that there are two worlds: the waking realm (Hona-Karekh), and the dreaming realm (Ina-Karekh). Living people visit Ina-Karekh temporarily via dreams, but at death they move in permanently. It’s their afterlife — and where they end up within that afterlife depends on the state in which they die. Dying in pain and fear pulls them toward a place of pain and fear in Ina-Karekh — the shadowlands, where nightmares dwell. To avoid being damned to this place for eternity, they must die at peace, ideally with the assistance of someone who can make sure they end up in a pleasant dream. This is where the Gatherers come in; Gatherers guide the dying so that they don’t end up in the shadowlands. Everything in Gujaareen culture serves this goal of dying at peace. So the people of Gujaareh frown upon anger, sorrow, and violence, because who knows when you might get hit by a bus chariot? They cultivate serene behavior and visit the priests of Hananja whenever they suffer injuries or emotional upheaval or mental illness, so that the priests can heal them or soothe away their pain. When a Gujaareen citizen grows old or ill or is too injured to be saved, relatives will submit a commission to the priests, asking one of them to come see the dying person off safely. Gatherers will also kill people who don’t appear to have any inner peace — people who commit violent crimes, for example. The Gatherers don’t do this to stop crime or to punish wrongdoers; they do it because people who resort to violence to solve problems are very likely to end up in the shadowlands — so the Gatherers send them to Ina-Karekh early as a kindness. This was all based on Egyptian religion, if you haven’t guessed already. The ancient Egyptian faith was centered on the idea of making sure the ka — the soul, to oversimplify — lasted as long as it could. The ka could live forever if the body could be preserved forever, so they mummified their dead. The Gujaareen believe not in eternal life, but eternal peace, provided one dies well. If the religion in the story is based on the ancient Egyptian religion, are there any other gods & goddesses in the story? There are, yes — but not in the story, note. Not in the way that they were “in your face” in the Inheritance Trilogy. Gujaareh (and Kisua, Gujaareh’s motherland) believes in a vast pantheon of gods. But while Kisua remains thoroughly polytheistic, Gujaareh has chosen to honor Hananja above all her brothers and sisters, because Hananja is the goddess of peace and dreams. She’s the one who remains eternally asleep, dreaming Ina-Karekh. But there are other gods, and a whole cosmology to contain them. The world of this story is not Earth — it’s the moon of a gas giant. They’re aware that it’s not their moon, that it’s the other way around, but they still refer to the planet as the Dreaming Moon. Because it’s so much larger than the sun in their sky, they’re not really sun-worshipers; they acknowledge Sun as one of the gods, but he’s a bit hapless, constantly getting into trouble and being reined in by Dreaming Moon. Dreaming Moon married him despite this, and they’re the parents of most of the gods (including Hananja). I shouldn’t read this stuff…I’ve got your books on autobuy so the blurbs just make me impatient. Sigh. I know The Narcomancer was your proof-of-concept story for the Dreamblood books and I really loved that story. Will we see any characters from that story in the Dreamblood books or are they completely separate, except for the world they’re set in? Completely separate, alas. In my mind, “The Narcomancer” takes place centuries before the Dreamblood books, but there’s nothing to connect them except Cet’s jungissa stone (the dragonfly), which is Nijiri’s in the novels. But Nijiri is only Cet’s successor in the spiritual sense. Hopefully you’ll grow to like the novels’ characters as much as you like Cet and Namsut and Ginnem! Will you be going on tour? If so, will you please come to Seattle, WA? I just wanted to say I love those covers and can’t wait to read the books. My TBR pile is growing out of control, but I plan to start your book in the coming weeks. I just finished Kingdom of the Gods last night (wow, the ending blew me away) and came looking to see if you had something else coming out. How delighted I am to know there are two new books coming so soon! I put them on pre-order immediately. I love your writing style because it’s refreshingly unique. I can’t wait to step into your newest world. I know this is not a question about the series, but I’m hoping you might take the time to answer it anyway… I just read that Patrick Rothfuss estimates that he reads around 250 books a year (crazy!) and was wondering if you also read a lot in a year (and if so, approximately how many). I set a goal for myself last year to read 12 novels and finished 22… I was pretty happy with myself until I read Rothfuss’ most recent blog! I checked on bookdepository.co.uk and it seems like both books can be pre-ordered already. Which I’d like to do. However, I was wondering if you perhaps already know the official ISBN numbers for them? I’d like to check if the ones on BD match. Alas, no. I can’t afford a book tour, time-wise or money-wise. But I’ll probably be attending a few conventions, and will post about them here! If I didn’t have a full-time day job as well as a full-time writing career, I’d read a lot more; I’m constantly cramming for the time to do so. When I was a teenager I could’ve easily matched Patrick, because I was voracious and would read anything. But these days time is short, and I’m picky about how I spend what little I have free — so it’s more like 20 books a year. Patrick’s got a job and a child, as far as I know, so I don’t know how he does it! He’s definitely putting us both to shame. Serena, here is the ISBN on the ARC: 978-0-316-18728-2. Hope that helps! 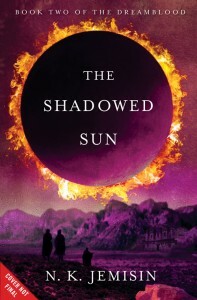 Do you also happen to know the one for The shadowed sun? Cos there are 2 books available for preorder and both have different details (I’m so confused): 1)ISBN 13: 9780316187299 or 2)ISBN 13: 9780356500775? Hi, I’m just wondering if these are going to be it for the series? Or do you have plans to drag things out as is so often done with fantasy literature (not naming any names) and leave audiences hanging until the story and characters have all unravelled so much that no one really cares when it all finally comes to a close? You can probably tell That I am hoping you say these are the only two planned books and that the story is complete. PS – For reference, Dead Souls by Gogol was one of the most frustrating things I’ve ever read….or, more accurately, the sequel to Dead Souls was the most frustrating thing I will never be able to read. I’m finishing the KoG for the 2nd time. When it first came out, I re-read HTK and BK just to refresh my memory of the whole world. It’s so good! After reading the blurb above & the chapter at the end of KoG, I can’t wait for this to come out. The covers look amazing. I just want to say thanks for making reading exciting again.